After months of care and with good weather on our side the GSPCA plan to release Marty the seal pup back in the wild tomorrow. With six seal pups the GSPCA have been the busiest it has ever been looking after what were all starving animals close to death when they were first rescued and we are delighted to announce the first is now ready to be returned to the wild. Today has been a very busy day as a second poorly seal pup from Jersey has arrived at the GSPCA. Marty as he has been named was rescued by the Jersey British Divers Marine Life Rescue yesterday on Green Island beach. He spent the night at New Era Vets and was transported kindly by Blue Islands from Jersey to Guernsey. He is only 18kgs and appears much older than Andrew that arrived last month form Jersey. Despite being 6 to 8 weeks of age he has a number of ailments from a chest infection to his emaciated condition. 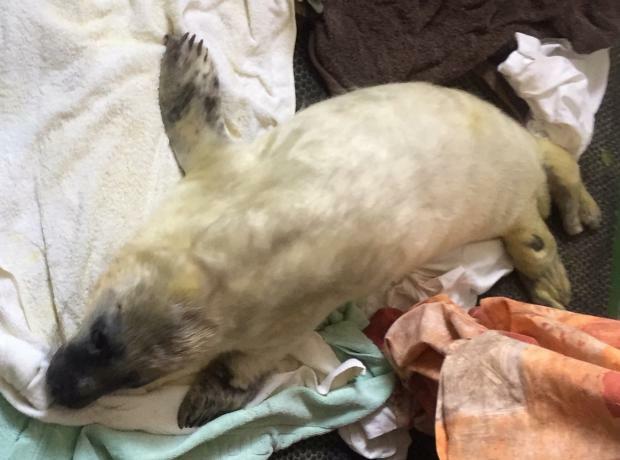 Last week Andrew the Jersey Grey Seal Pup was rescued and transported to the GSPCA. At only 17kgs and less than a week old this very pretty young seal pup should have still been with his mum and not in the emaciated condition as he was found. Andrew has a very bad chest infection and desperately underweight and has been receiving care around the clock day and night. For nearly two weeks Trevor and Temperance the Channel Island seal pups have been at the GSPCA. Both pups are still in intensive care and receiving around the clock treatment and feeds. 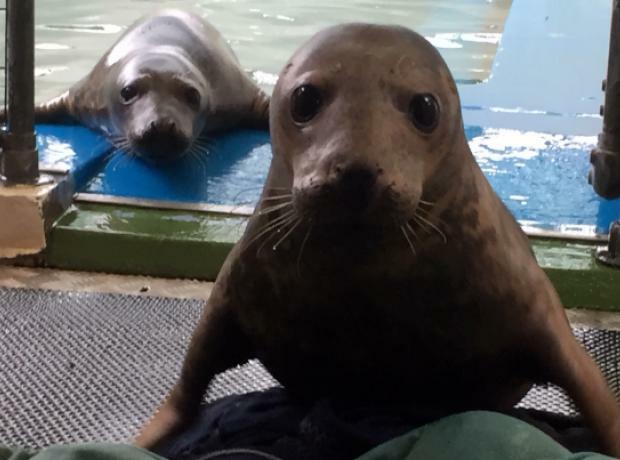 Trevor at only 11.5kg from Jersey and Temperance the Guernsey seal pup rescued from Beaucette Marina at only 11kg are in an adjoining enclosure and both are currently cared for at the intensive care seal unit in the GSPCA wildlife building. Today a grey seal pup rescued in Jersey on Sunday at just 11.5kg has just arrived at the GSPCA in Guernsey. Trevor as the 2 week old pup has been named has joined Temperance of a similar age at the GSPCA seal unit in Guernsey. Both pups are around a quarter the weight they should weigh and both very weak so are in intensive care at the GSPCA. The Jersey pup was rescued by the local branch of the British Divers Marine Life Rescue and was discovered severely underweight at L’Etacq. Fathers Day has been a very special time for one youngster at the GSPCA. 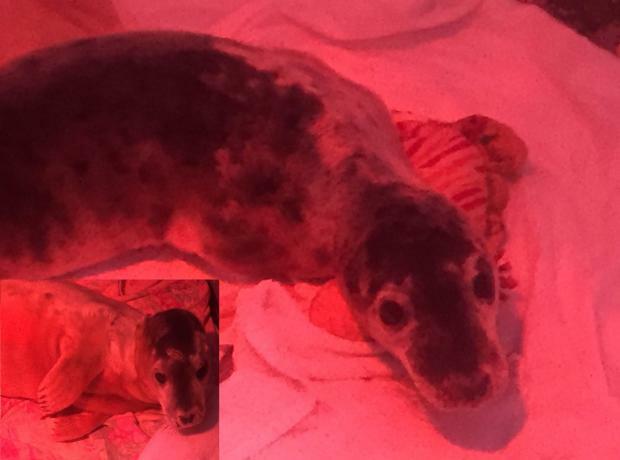 Sami the grey seal pup who was rescued in Jersey on a cold winters beach close to death at just over 13kgs by the Jersey British Divers Marine Life Rescue Medics has had a long road to recovery. Less than a third of what she should have weighed at two weeks of age the grey seal pup was extremely lucky to survive. After her initial first aid in Jersey Sami was flown to Guernsey where she was initially tube fed and treated every two hours day and night.